The early results at the Orleans Arena speak for themselves. Team World members are accomplishing what they set out to do, and although there’s still a lot of ground to cover before the four-day event wraps up Sunday, they are in the driver’s seat. Team World grabbed a 13.5-4.5 points lead after winning two of three men’s team competition games – and tying the third game – Friday night, halting Team North America’s modest comeback earlier in the day. The North Americans swept all three afternoon mixed doubles matches, after falling behind 11-1 in points, but Team World reasserted its dominance with a solid performance in the evening. It’s been a dream start for Team World, but not totally surprising considering its talent, effort and ability to ready tricky ice so far this week. Consider that Team World’s roster consists of Olympic women’s gold-medal champion Anna Hasselborg and reigning world men’s champion Niklas Edin, both from Sweden. Team North America is loaded with talent, too, but so far has been outgunned. “This is the best (World Financial Group Continental Cup) lineup we’ve ever had,” said Edin, who skipped his Team World outfit to a 7-4 victory over Team North America’s John Shuster Friday night. “It’s a good thing for us that we have only three countries represented so we can speak the same language in a lot of the games. It just makes it a lot closer because that’s what they have every year. They know each other and speak the same language. For us that’s always been a struggle, dealing with the time change. It shows now how big a difference that is. Peter de Cruz and his Swiss mates added another team point to the Team World total, dispatching Team North America’s Kevin Koe and his Calgary-based outfit 8-4 in a rather one-sided affair. 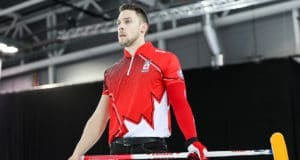 The best Team North America could muster on the evening draw was a half-point when Brad Gushue of St. John’s, N.L., was able to salvage a 4-4 draw with Scottish skip Bruce Mouat’s Team World foursome. If this was a boxing match, the referee might have stepped in to separate the combatants, so one-sided it has been. But the format works provides Team North America with a chance to come back. They may have lost the war so far, but can still win the battle because the big-point matches are coming up. The big payoff comes in the Skins format on closing Sunday when 30 points are up for grabs over six games, so the North Americans are very much alive and kicking. That depends, of course, on how Team North America performs in Saturday’s scramble events, which are new to the World Financial Group Continental Cup format this year. 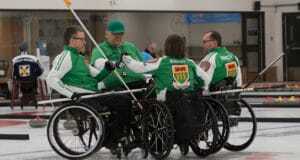 The Team Scramble and Mixed Team Play events, worth 12 points in total, put an emphasis on how curlers can perform with teammates they’d regularly play as opponents.